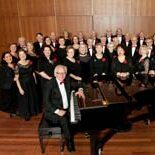 The Ashton Smith Singers are a choral ensemble founded and directed by David Ashton-Smith in 1980. Known for their choral sound, the Singers perform regularly with the Australian Pops Orchestra, contributing to diverse programs of opera, music theatre, Viennese, Broadway and ‘Best of British’ programs. The Singers performed with Dame Edna Everage on invitation in her ‘Song of Australia’ series of concerts and have appeared on TV specials, contributed to film soundtracks (Garbo, Lilian’s Story, The Wog Boy) as well as provided choral input to TV and cinema advertisements(Mazda, Carlton Draft). The Singers also present concerts featuring classical works including Mozart’s ‘Requiem’, Haydn’s ‘Nelson Mass’ and John Rutter’s ‘Gloria’ and are much loved for their annual Christmas concerts which has resulted in the release of two CD’s titled ‘Christmas with the Ashton Smith Singers’.